Since the last time I wrote about refractive surgery, following the AAO meeting of 2002, a lot of questions raised at the time have been answered. At that time (see An AAO 2002 Update: Classic vs. Custom LASIK — the Battle Continues, OSN, January 1, 2003), the major question was, is customized ablation that much better than conventional LASIK? I reported that the results being obtained with customized LASIK (as reported during the 2002 AAO meeting) were, in general 10% - 15% better than that obtained with conventional LASIK. But, because customized ablation treated higher order aberrations (coma, tilt, and spherical aberrations), in addition to the lower orders of sphere, cylinder and defocus, that the quality of vision (contrast sensitivity and especially night vision – the lack of halos) was dramatically improved. Now, in a series of articles presented in a supplement to the April 2006 issue of Cataract & Refractive Surgery Today entitled, “Piecing Together the Laser Vision Correction Puzzle” (provided as an unrestricted educational grant from Advanced Medical Optics), I believe the answers to my original questions are now quite clear. Wavefront-guided LASIK (custom ablation) is better that either wavefront-optimized LASIK (wherein wavefront measurements are used to provide optimized ablation algorithm – but not used directly to guide the laser) and standard or conventional non-waveguide LASIK. The only thing he left out was the improved, smooth corneal bed provided by using the femtosecond laser (IntraLase) to provide the flap. In a panel discussion – “Wavefront-Optimized or Wavefront-Guided?, Andrew Holzman, Sao (John) Liu, Jeffrey Machat, and Mark Whitten concluded that the new technological laser platform improvements are driving wavefront-guided results to the top. This is probably best shown in the retreatment results reported by three of the participants (shown below in Figure 1. ), whereby retreat rates using the new VISX Star S4 CustomVue platform has dramatically dropped by at least half over the generally good results obtained with the WaveLight Allegretto wavefront-optimized algorithm. Figure 1. 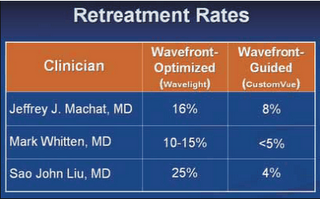 Retreatment rates improve when moving from wavefront-optimized to wavefront-guided ablations. Source: “Wavefront-Optimized or Wavefront-Guided?”; pg 5 of the April 2006 supplement “Piecing Together the Laser Vision Correction Puzzle”; CRS Today; supported by an unrestricted educational grant from Advanced Medical Optics and used with permission of CRS Today. Mark Whitten, in a separate article, “Look to Wavefront-Guided Surgery to Reduce Enhancement Rates”, reported on his results using conventional ablation and wavefront-optimized LASIK versus the VISX CustomVue with just the Fourier upgrade and with both the Fourier upgrade and the Iris-registration upgrade. As shown in Figure 2, he has reduced his retreatment rates with the CustomVue with Fourier and Iris registration to below 5%, from the 20%-25% it was with conventional LASIK! Figure 2. Advancements in the CustomVue platform, including the Fourier upgrade and Iris Registration, have reduced retreatment rates. Source: “Look to Wavefront-Guided Surgery to Reduce Enhancement Rates”; Mark E. Whitten, MD; pg 10 of the April 2006 supplement “Piecing Together the Laser Vision Correction Puzzle”; CRS Today; supported by an unrestricted educational grant from Advanced Medical Optics and used with permission of CRS Today. And finally, Steven Schallhorn created a model to look at the differences in higher order aberration RMS between conventional LASIK, wavefront-optimizes LASIK, and wavefront-guided LASIK. In his discussion (“Modeling Quality of Vision After Laser Vision Correction”) he showed that going to wavefront-guided ablation, regardless of the type of eyes treated, that this type of LASIK predicted the lowest mean change in HOA RMS (see Figure 3). Further, the odds of inducing significant higher order aberrations were also lower with wavefront-guided ablation than with either wavefront-optimized or with conventional LASIK. Figure 3. The model shows that wavefront-guided LASIK provides a dramatic improvement in results over both conventional and wavefront-optimized ablations. Source: “Modeling Quality of Vision After Laser Vision Correction”; Captain Steven C. Shallhorn, MD; pg 12 of the April 2006 supplement “Piecing Together the Laser Vision Correction Puzzle”; CRS Today; supported by an unrestricted educational grant from Advanced Medical Optics and used with permission of CRS Today. So, as the pendulum (and laser platform technology) moves forward toward vastly improved results, it is becoming more apparent that visual outcomes are greatly improving as ophthalmology moves toward wavefront-guided ablation.